Antiquorum Auction House in Geneva, Switzerland sold this rare and beautiful Rolex Triple-Date Moonphase in March of 2011 for $76,000. It has a very rare red date hand coupled with an unusual black-back moon disk. 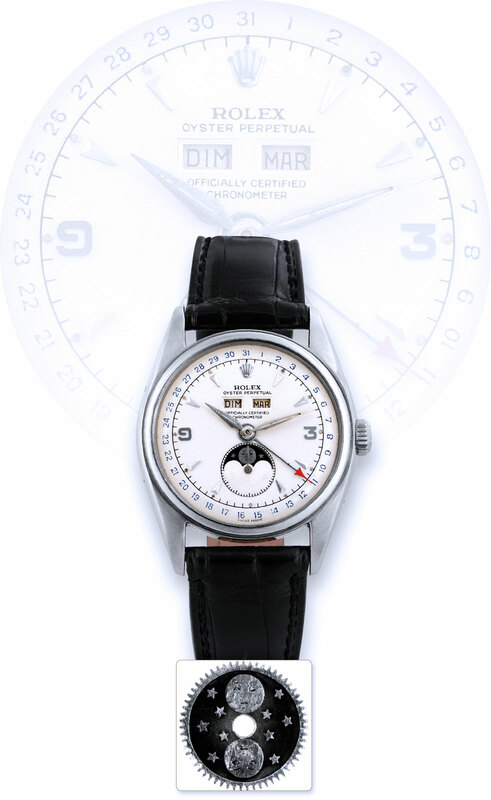 Update: John Goldberger wrote in to say that the dial on this watch is a "fake redone dial" and said "The quality of your blog is declining?" It is pretty funny, to have a guy like John Goldberger who is one of the top Rolex and Patek Philippe collectors in the world constantly pointing out errors I make ;-) Actually, I like his assistance.